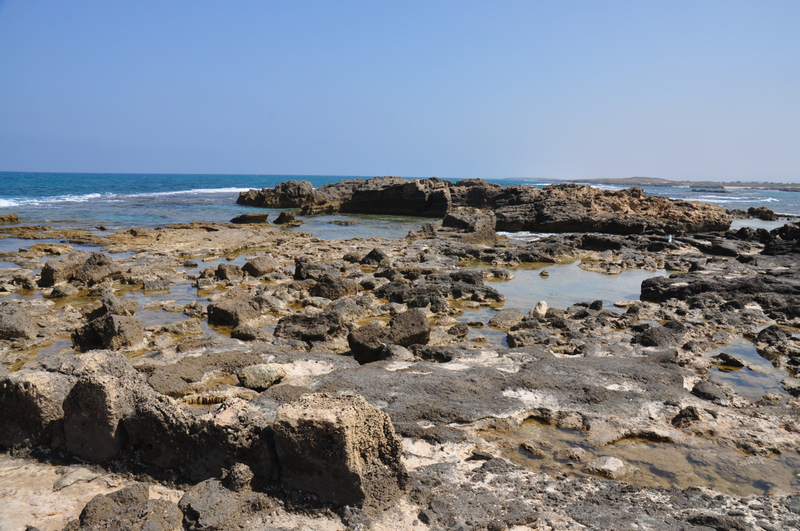 Running parallel to the Mediterranean coastline of Israel are three underwater sandstone ridges (and two on land). These were created about a million years ago when sea sand dunes fossilized, creating eolianite rock, called kurkar. You can click on the image for a larger view (which may take some time to load depending on your Internet connection). Please share this post with your friends by clicking on the icons at the end of this message. The technical details – the photo was taken with a Nikon D90 DSLR and 18-70mm lens in June (ISO 200, 18mm, F10 at 1/250 sec). Photographs on this website are © Shmuel Browns (unless marked otherwise) – if you are interested in purchasing one of my photos or using one of my photos for your own project please contact me. This entry was posted in Nature, Photography and tagged beach, Israel photo, kurkar, photo of week, Photography, sand dune, sandstone on February 17, 2013 by Shmuel Browns. I love to see the sandstone ridges in Tel Aviv. The one farther to the East can be seen between the Kiryah and the Azrieli towers and continues farther to the south, seen between the Hagana train station and the Central Bus station. A bit of prehistory intruding into the modern city.